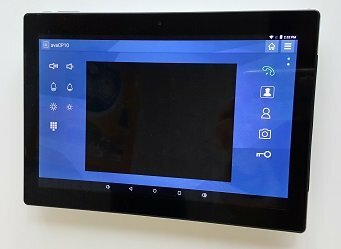 The CP-11 10.1 inch Android Intercom Monitor Control Panel is a multi-touch panel with rectangular shape that has an easy-to-install surface mount to control your video intercom. The control panel also interfaces with PoE connectivity option to reduce installation costs. Using CP-11 to turn your house into a digital home just got easier with the help of plug and play equipment. The CP-11 control panel combines a CPU board, a LCD display, and a user-friendly human machine interface touchscreen within a compact housing. It is operated by Android operating system and supports Wi-Fi and SIP protocol with Door Phone. The CP-11 provides a comfort digitalized home environment and meets your door entry communication needs.